The thickness measuring devices BB20 and BB25 reveal any fraud! If you have ever bought a used car you will know the problem: How to recognize a car accident by a accident-free model? Quick overpainted many damages are no longer visible to the naked eye. With a coating thickness meter go the thing on the ground: here was the pint redone? The clear display shows excatly the underlying layers of lacquer on the micron. The coating thickness meter from Trotec - a small helper for more security when buying used vehicles. By the way: Not only automotive paints, and all other non-magnetic coatings and non-ferrous metal such as aluminum layers can be measured by the coating thickness meter. The coating thickness meter is also suitable for galvanizing, enamelling or chrome plating. 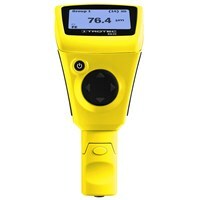 The BB25 can particularly store up to 2500 measured values. So comparative measurements of paint or protective coatings are no longer difficult!